Cats and dogs love to drink fresh, oxygen-rich water. This is easy with the Drinkwell 360 cat fountain. 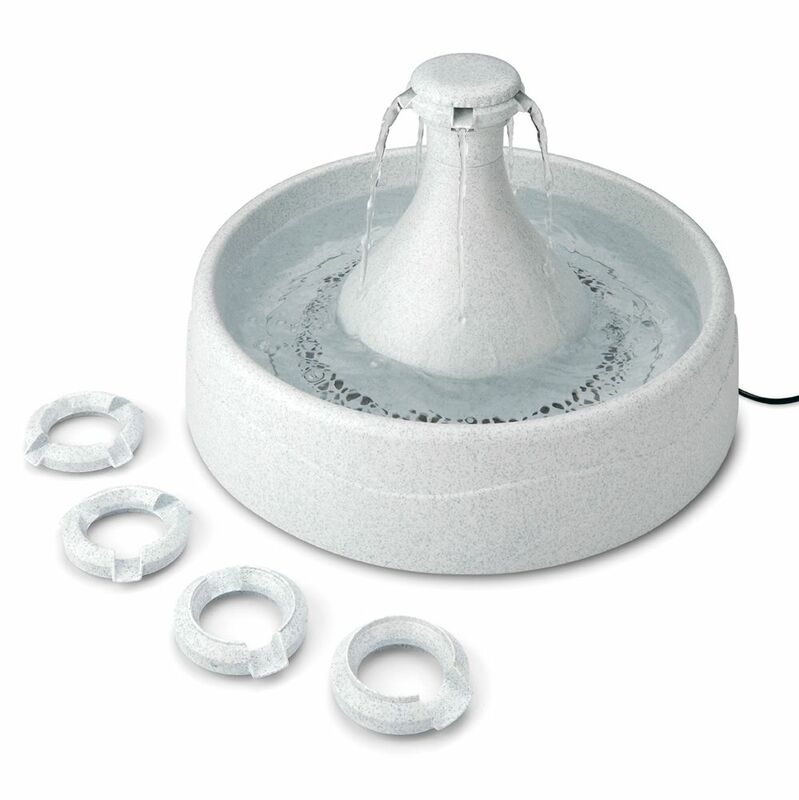 This unusual fountain has all the same advantages as the Original Pet Fountain. A free-running waterfall encourages your pet to drink more so you know that your dog or cat is drinking enough fresh water. Many vets recommend drinking fountains as a way to help your cat reduce the risk of kidney and bladder stones. The Drinkwell 360 fountain has an integrated water reservoir and a filter to prevent hairs or food getting into the pump, which also keeps the water smelling clean. The new design includes a top quality pump which is almost silent. A further great feature are the interchangeable attachments which change the waterfall. You can decide whether to have a single, double, triple or quadruple waterfall. The Drinkwell 360 fountain has been manufactured to the usual high Drinkwell standards which are based on over 10 years of fountain production. Delivery includes a filter which should be changed within 2 weeks. Waterfall like running tapwater Variable water flow Carbon filter for fresh, clean water 4 interchangeable water flow attachments Ramp to reduce the sound of running water Almost silent thanks to high quality pump Integrated reservoir, volume approx. 3.8 litres Anti-slip feet Low voltage current 12V Please note: This device is designed for use in Germany and thus comes with a power adapter for use in the UK. Important: The fountain should be cleaned weekly with hot, soapy water to prevent cat hairs and other particles getting inside, which could affect the performance of the fountain. Furthermore, depending on how hard the water in your area is, the fountain (and maybe the pump) should be cleaned with vinegar and water. Instructions are enclosed. Please rinse the fountain carefully after descaling. Please use only clear water (no soap) to clean the filter. The filter should be changed approx. every 2 weeks. Please make sure that the water level in the reservoir is correct. The pump must not be allowed to run dry. If this happens, the guarantee is no longer valid. It is recommended that you change the filter every 2 weeks. What's this?.